Horseradish and lemon bring zing to the humble potato salad. By adding salmon gravlax or smoked trout, it becomes a tasty meal. Potato salad tastes best when the potatoes haven't been stored in the fridge before serving. Cook, peel and slice them, then put aside at room temperature until needed. Put the potatoes in a large pot, cover with water, bring to a simmer and cook until tender. Pour them into a colander and cool slightly. Start peeling the potatoes before they cool completely as the skin sticks to them more when they're cold. For the dressing, mix the buttermilk, horseradish, the juice of one lemon, salt, pepper and olive oil well. 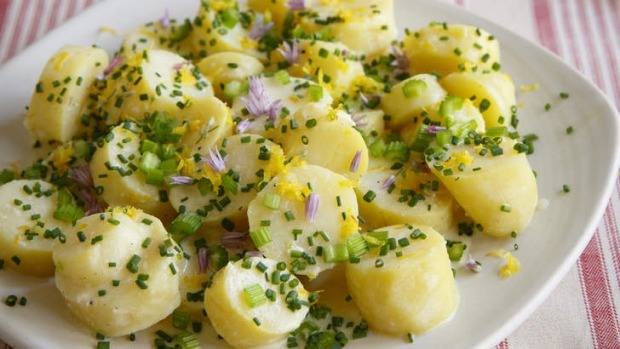 Cut the potatoes into 1cm rounds and place them in a mixing bowl with the celery and chives. Pour enough dressing over to coat the salad well. Pour into a serving bowl and grate zest from remaining lemon over the salad. If you can find them, chive flowers make a nice finishing touch.